Over the previous 12 business cycles, the best money managers during a cycle produced average annual compounded total returns of 25% to, in a few rare cases, 30%. This small group consisted of either growth-stock managers or managers whose most successful investments were in growth stocks plus a few turnaround situations. The best undervalued-type managers in the same period averaged only 15% to 20%. A few had gains of over 20%. Mos typical investor haven’t prepared themselves enough to average 25% or more per year, regardless of the method used. Value funds will do better in down or poor market periods because their stocks typically haven’t gone up a large amount during the prior bull market periods, so they will correct less. Amazon was able to grow sales and earnings steadily in the past five years and it is still projected to grow EPS at 34.83% next year and 44.33% next five years. It is never the P/E ratio that mattered, it is the growth rate of the company that matters! Because Amazon is such a high growth and high quality stock, the street has given it a very expensive P/E ratio. 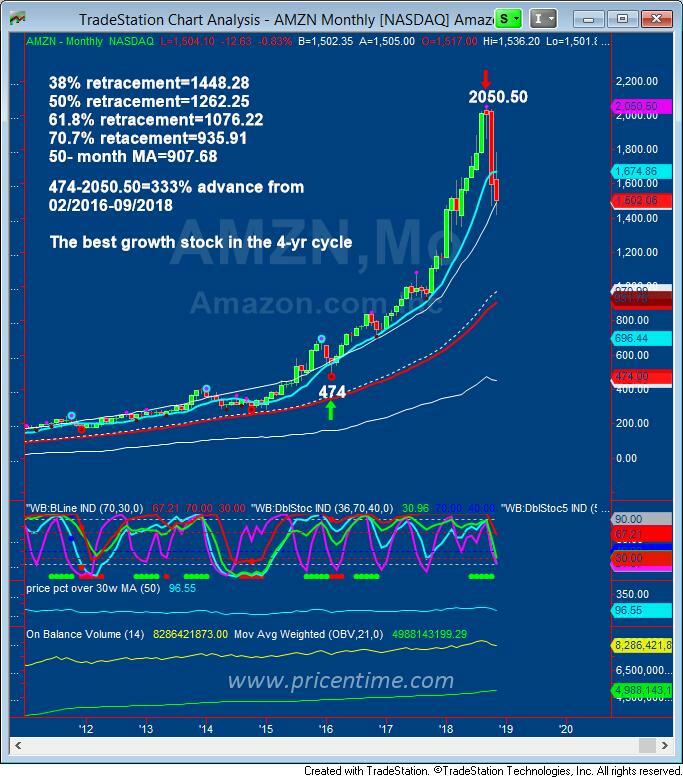 Now the general market has entered a correction phase and the confidence is low, Amazon is not immune to the correction either. So far it has corrected over 20% and we believe it still has ways to go. We are carefully watching the downside price targets, we believe if it hits the 50-month moving average at 907.68, it will be a great bargain. Most likely it will not get there, we have to give it time to see how it develops. Most of the time, a previous leader may not come back as a new leader in the next cycle. For example, Facebook and Apple may not get back to their formal glory. Social media is a relative new thing in people’s lives. Will people continue to use social media in the future? Do people need to have social media to live? Do people need to have iPhone to live? What if people get tired of iPhone and switch to something else? Apple has to invent something in addition to iPhones to continue to lead. Without continuous innovation, the growth will plateau. Amazon, Netflix and Microsoft don’t have the issues like Facebook and Apple face. We believe Amazon, Netflix and Microsoft have better chance coming back as leaders again in the new cycle. Out of the three, Amazon stands out as there is no visible competitor in Amazon’s space. Netflix has a lot of debt and the competitors are inching in. Microsoft has competitors in cloud space, but no competitors in other areas. Of course, we will observe what the charts say when the time is right. It has been 18 tradings days since the October 29th low. It looks like the market will try to re-test the low and flip back up in the next few days. It may even rally to the year end from here, but you have be cognizant that the rally is a bear market rally, it will be choppy, wide and loose. It is best to use this time to study the market, analyze what you have done wrong in the past. The winter will pass, and the spring will come when you are expecting it the least. This entry was posted	on Sunday, November 25th, 2018 at 7:27 pm	and is filed under Forecasts, Stock Indices. You can follow any responses to this entry through the RSS 2.0 feed. Both comments and pings are currently closed.